This entry was posted in Academic achievements, Academics, Faculty, Staff and tagged civic engagement, fellow, science on June 20, 2012 by Wire Eagle. AUBURN – Robert Holm, assistant director of education in Auburn University’s Office of Sponsored Programs, was recently appointed a SENCER Leadership Fellow by the National Center for Science and Civic Engagement. Chosen from a group of more than 2,500 nominees, Holm is one of nine educators elected to this year’s class of fellows. SENCER, or Science Education for New Civic Engagements and Responsibilities, is a National Science Foundation-supported faculty development and science education reform initiative that engages students in sciences and mathematics by focusing coursework on real world problems. Holm will serve an 18-month appointment, during which he will work to advance science, technology, engineering and mathematics, or STEM, education and teaching. 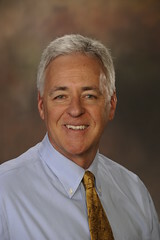 Holm joined Auburn’s Office of Sponsored Programs in April. Prior to that, he was the director of the Institute for Research and Scholarship at Butler University in Indianapolis from 2000 to 2012. He received his bachelor’s degree in biology from the University of Miami and his master’s and doctoral degrees in biological sciences from Northwestern University. He has more than 25 years of experience in the environmental management field, and has held governmental positions including administrator of the Environmental Resources Management Division for the City of Indianapolis, manager of Environmental Programs for the City of St. Petersburg, Fla. and manager of the Coastal and Wetlands Section for Metro Dade County, Fla. Holm has taught courses in environmental biology, water quality in the urban environment, environmental pollution and environmental technology. With his recent move to Auburn, Holm plans to continue to lead SENCER initiatives by introducing the approach to his new colleagues, many of whom are interested in experiential learning. SENCER was initiated in 2001 and has established formal projects designed to develop and implement SENCER courses with teams that have included more than 2,000 educators, administrators and students from more than 430 two- and four-year colleges and universities, non-governmental organizations, government agencies, educational associations and community-based organizations.